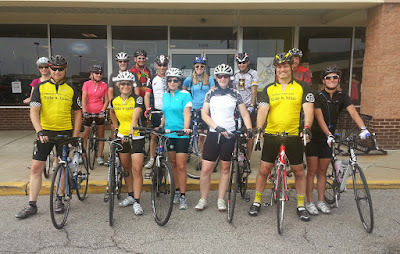 Beginning in 2013, Century Cycles has been inviting road cyclists to join us for our monthly "Sunday Service" Group Road Bike Rides! We're bringing them back for our 3rd year in 2015! Your own bicycle and helmet are required. No pre-registration is necessary. The pace is "medium" - not too slow, not too fast, and we wait at each turn for people to catch up. In Medina, we ride on the third Sunday of the month. Meet in the parking lot outside the front door of the store. The rides begin at 8:00am. Our route is about 20 miles; you can check it out here! In Peninsula, we ride on the first Sunday of the month. Meet in the store parking lot. The rides begin at 10:00am if the store opens at noon, or begin at 8:00am when the store opens at 10:00am. 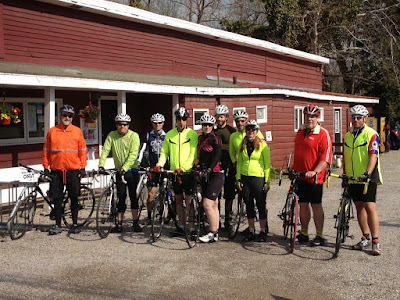 We usually ride the Valley Loop, an 18-mile gently rolling route along the Cuyahoga River. In Rocky River, we ride on the second Sunday of the month. The rides begin at 8:00am. The route varies depending on what the group decides. Note that the dates for the first rides in April are pushed back one week because of the Easter Sunday holiday. You'll have help in case you get a flat tire or anything, but you should have what you need to be self-sufficient: water/sports drink, spare tube, tire levers, pump, mobile phone (all of the Things You Should Bring on Every Bike Ride). Please note, the name "Sunday Service" is a play on words; there is no religious component to this event (unless, of course, cycling IS your religion)!